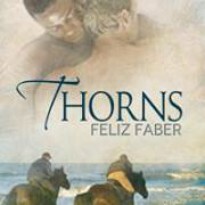 I'm Feliz Faber, writer, translator, proofer--and reader. A surprise meeting in his favorite bar, a derailed train and a blizzard who gives a snow day to all "non-essential employees" creates a chance for Seth to get back together with his first boyfriend, Kieran. They met at their summer job when they were seventeen, but haven't seen each other since. Now, more than a decade and several men for both of them later, they might be mature enough to make what was once a mostly innocent summer love into something that lasts.